Fibromyalgia describes widespread, chronic pain and fatigue that generally inhibit a patient from performing daily activities. The pain usually is felt as musculoskeletal complaints, and it tends to center on certain points in the body, called tender points. This condition also affects memory, sleep, and mood. Many patients feel incredibly tired in addition to the pain in their muscles. Although fibromyalgia has been identified for a number of years, treatments are generally supportive rather than curative. The primary cause of this condition is not well understood, and that may arise from the fact that it has only been recognized as a treatable condition fairly recently. In the past, it was mistaken for depression and other psychological problems, and in some cases, it was merely diagnosed as chronic fatigue syndrome. As the research into fibromyalgia has progressed, it has been found that this constellation of symptoms tends to appear after some form of trauma, such as surgery, infection, illness, or a stressful situation. However, it may appear without these inciting factors, and that makes the condition more difficult to diagnose and to treat. For a reason as yet unclear, women tend to have fibromyalgia much more often than men. In addition, it tends to run in families, so a strong genetic link is suspected, although no particular gene has been isolated as a cause. Even so, the disease can appear without much warning or precedent. Some patients experience symptoms after undergoing a major infection, such as pneumonia or other relatively systemic infection. Smaller infections, such as the common cold, do not seem to be a trigger, and usually the infection or illness is severe to cause a fibromyalgia outcome. Interestingly, patients who suffer from post-traumatic stress disorder are more likely to have the condition than the general population. Again, this points to a large, overwhelming stressor that changes the body chemistry and leads to this mysterious pain condition. Any other physical or emotional trauma, such as a car accident, a nasty divorce, or the death of a loved one, can prompt the symptoms to appear. Finally, rheumatic diseases, such as rheumatoid arthritis and lupus, tend to initiate the pain of fibromyalgia in patients. Since researchers are still investigating the cause of the condition, nearly anyone could potentially manifest symptoms of fibromyalgia. A dull, achy muscular pain is usually the primary pain symptom of fibromyalgia. However, it is not simply muscle pain, as the discomfort in this condition tends to follow a pattern. Certain areas of the body display intense pain responses, and they are known as tender points. The points are the back of the head, between the shoulder blades, on the tops of the shoulders, on the sides of the neck, in the upper chest, on the outer elbows, the upper portion and sides of the hips, and on the inside of the knees. 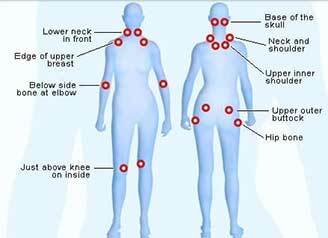 To qualify as fibromyalgia the pain has to occur on both sides of the body, both above the waist and below. Most of the tender points must react painfully, but it is not necessary for a patient to display pain in all of them. Symptoms other than pain usually present with fibromyalgia, but they may be related to the discomfort. For instance, trouble sleeping is often seen with this condition, but that may arise from the fibromyalgia itself or from the pain that keeps patients awake. Likewise, mood disturbances, such as depression and anxiety, are very common with this condition. The connection between pain and mood is not well understood, but the two are generally found together and respond to some of the same treatments. Many patients start off their journey with fibromyalgia by seeing their primary care physician. After a thorough work-up, these general practitioners usually send patients to doctors who specialize in pain conditions. One possible physician you may encounter would be a rheumatologist, particularly if rheumatoid arthritis or lupus is suspected. In most cases, the patient will be treated for the chronic pain condition by a pain management physician, and they will coordinate other treatments in conjunction with the primary care doctor. The front line treatment for fibromyalgia by pain management doctors is medications. As mentioned above, antidepressants are often prescribed for mood adjustment, but they are also quite effective in relieving pain. Cymbalta is an anti-depressant that has been studied and found to be effective in treating the pain of fibromyalgia. 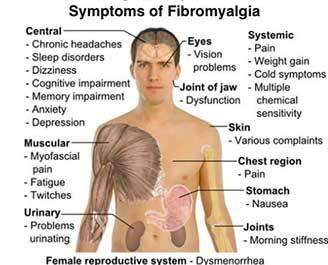 In addition, anti-seizure medications, such as Lyrica, can also help with the fibromyalgia pain. Muscle relaxants, such as baclofen, and anti-inflammatory medications, such as ibuprofen, are also used to control pain. By combining these medication types, most patients experience pain relief. Opioids are not generally used for fibromyalgia because they tend not to decrease the specific pain of the condition. A special intravenous infusion called a Meyer’s cocktail has shown some promise in helping patients with their pain. It is a blend of several vitamins and nutrients that can correct imbalances in the body. Of course, the treatment for fibromyalgia doesn’t stop at medications. Pool therapy, physical therapy, cognitive behavior therapy, acupuncture, and chiropractic care are all viable adjuncts to medications, and your pain management physician can help you navigate your choices to select the treatment that is right for you.